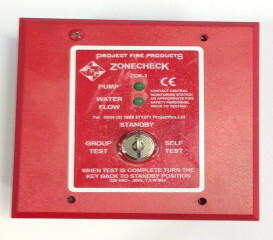 Nationwide fire sprinkler flow switch testing. Hyden UK offer a nationwide service to attend and carry out routine fire sprinkler flow switch testing. Do you have one of these water flow switches in your store? It is likely that the shopping centre you are situated in will require that you have this fire sprinkler flow switch tested either twice or four times a year. If you decide you would like to combine your fire sprinkler flow test switch with any other of our services it is a great way to save money and keeps disruption to a minimum.